Eastern Loggerhead Shrike - Have you seen this bird? If youre ever walking through grassland and come across a grasshopper speared on a twig, dont assume it was a bad bounce. Youve found evidence that youre sharing habitat with shrikes! 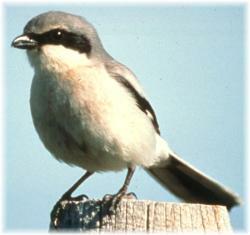 The Eastern Loggerhead Shrike (Lanius ludovicianus migrans) is a grassland bird slightly smaller than a robin. Mostly grey with a white underside, it has white markings on its primarily black wings and tail and a raccoon-like black mask around its eyes. 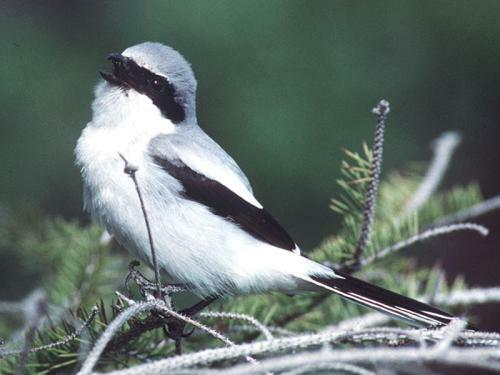 Like its slightly larger cousin the Northern Shrike (see below), the Loggerhead Shrike is a predatory songbird. Because they lack strong talons or claws, shrikes often impale food on branches, thorns or barbed wire fences to help them tear prey into bite-sized pieces. For this meat hanging characteristic, shrikes are often referred to as butcher birds. The Loggerhead Shrikes diet consists primarily of mice, voles, grasshoppers and other insects, while the more predatory Northern Shrike eats a much higher proportion of small rodents and even small birds. Manitoba is for Serious Shrike Spotters! The Eastern Loggerhead Shrike is an Endangered subspecies of shrike that can be seen from May to September in eastern Manitoba. Another subspecies of loggerhead shrike, the Prairie Loggerhead Shrike (Lanius ludovicianus excubitorides), looks like the Eastern Loggerhead Shrike but inhabits western Manitoba during the summer, especially the extreme southwestern part of the province. This shrike subspecies is listed provincially as Endangered and listed nationally as Threatened, meaning it is likely to become Endangered if trends and limiting factors are not reversed. 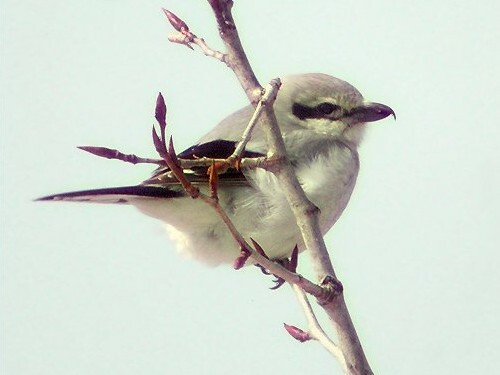 The Northern Shrike (Lanius excubitor), a slightly larger, lighter coloured species, nests in Manitobas northern taiga and tundra but migrates to the southern part of the province where it spends the winter. If you see a shrike in the fall or winter in Manitoba, it will probably be a Northern Shrike. When you support Nature North with a Donation, you help the Eastern Manitoba Loggerhead Shrike Recovery Action Group and others get the message out to help conserve Manitoba's wildlife! 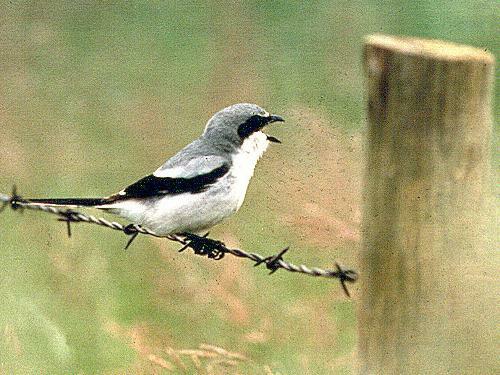 In 2001, at least nine Eastern Loggerhead Shrike pairs were found nesting in Manitobas only known breeding area located north of Winnipeg. In an attempt to locate more of the birds in eastern Manitoba, the first volunteer Loggerhead Shrike Survey was conducted in May 2001. Twenty dedicated teams of volunteers covered more than 1,000 km of roads in 20 townships. No new occurrences of the bird were identified, confirming its rarity in the province. Shrikes nest in isolated trees and shrubs that grow near mowed areas or well-grazed grasslands. They are often seen perched on power lines, fences and other elevated sites in suitable hunting terrain where they can swoop down on prey. This swooping behaviour and the attractive grassland habitat of roadside ditches make Eastern Loggerhead Shrikes especially vulnerable to collisions with vehicles. Habitat loss and environmental contamination are also identified as factors that may directly or indirectly limit populations of the bird. Monitoring of Loggerhead shrike pairs in southeastern Manitoba has shown that predators and cool, wet weather cause many nests to fail. Young are particularly susceptible to wet weather when they are about a week old. Their growing appetites force parents to spend more time hunting for food and less time in the nest watching over the young. Common predators of eggs and young are other birds like crows or magpies, and mammals like raccoons and cats. Public education on the plight of Loggerhead Shrikes and increased awareness of opportunities to participate in monitoring and management efforts. 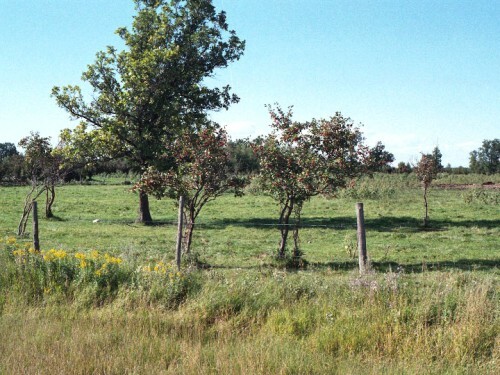 To date, 28 Manitoba landowners have voluntarily agreed to enhance Eastern Loggerhead Shrike habitat in cooperation with EMRAG. Similar recovery action groups have been established in Ontario where a larger population remains, and in Quebec where the birds have also occurred historically. Stewardship activities that benefit both shrikes and landowners include fencing out livestock from dugouts and establishing an alternative watering system; converting cropland to grassland; implementing a rotational grazing system to improve grassland quality and provide shrikes with a mosaic of habitat; and improving shrike nesting, perching and hunting opportunities by planting isolated trees and shrubs or shelter-belts in yards or pastures. 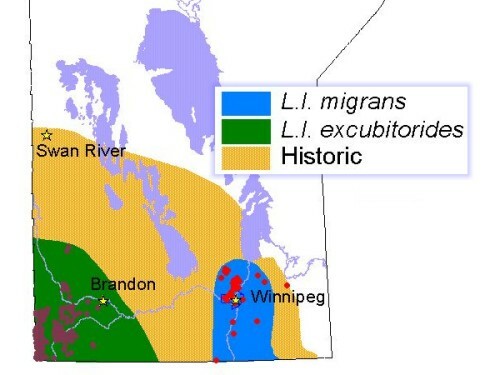 EMRAG members include the Canadian Cattlemens Association, the Manitoba Cattle Producers Association (MCPA), Manitoba Conservation, Manitoba Hydro, City of Winnipeg, Ducks Unlimited Canada, Portage Natural History Society, Prairie Farm Rehabilitation Administration and other interested individuals. Thanks for learning about Loggerhead Shrikes! Bye for now!